Paul Manafort arrives for a hearing at U.S. District Court on June 15, 2018, in Washington, D.C. A judge said Wednesday he intentionally lied to the special counsel's office. A federal judge has ruled that President Trump's former 2016 campaign chairman Paul Manafort intentionally lied to special counsel Robert Mueller's office after agreeing to cooperate with its investigation into interference by Russia into the last presidential election. 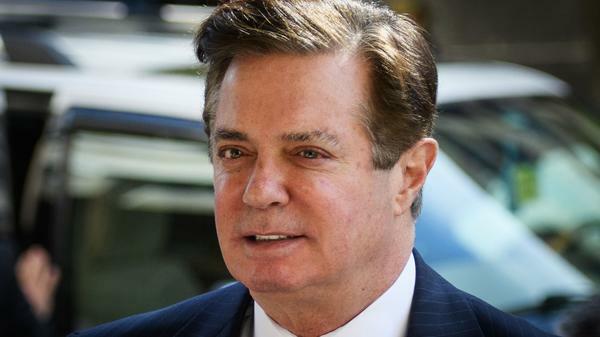 The ruling from Judge Amy Berman Jackson means prosecutors are no longer bound by their plea deal with Manafort, who now faces the prospect of spending the rest of his life in prison. Manafort agreed to plead guilty only days before a trial last year in Washington, D.C., and prosecutors agreed to consider recommending leniency for Manafort based on his cooperation. He had already been convicted of eight felonies in a separate case last year in Alexandria, Va., including tax and bank fraud. Last year the Justice Department laid out the falsehoods it said Manafort had told investigators since agreeing to cooperate — including lies about payments and financial relationships to a law firm and about his dealings with his business associate Konstantin Kilimnik, who also was indicted last year and whom the FBI has linked to Russian intelligence services. Mueller's office also said Manafort has been untruthful about his continued contacts with people in the Trump administration and other topics. Manfort's attorneys had argued in response that the statements highlighted by the special counsel's office were simply inadvertent comments and were not part of a pattern or concerted effort to circumvent his agreement, and thus should not negate it. In her ruling, Jackson agreed with prosecutors, writing that the special counsel had "established a preponderance of evidence that defendant intentionally made false statements" to the FBI, Mueller's team and the grand jury. Manafort will be sentenced March 13. The order from Jackson notes that she is not addressing "the question of whether the defendant will receive credit for his acceptance of responsibility" when it comes to sentencing guidelines. Trump hasn't ruled out pardons for Manafort or others within the 2016 campaign who are in legal jeopardy as a result of the Mueller investigation. The president has repeatedly denied any collusion between his campaign and Russia. He has also repeatedly called Mueller's investigation a "witch hunt" and said suggestions there was collusion with Russia are a "hoax." Paul Manafort's plea deal is off. A federal judge ruled tonight that a former Trump campaign chairman, Paul Manafort, intentionally lied to the FBI and to Robert Mueller's investigation. That violated the plea deal he reached with prosecutors before his second trial last year. We're joined now by NPR justice correspondent Carrie Johnson. Good evening, Carrie. CARRIE JOHNSON, BYLINE: Hi, Audie. CORNISH: Remind us about that plea deal, and tell us what went wrong. JOHNSON: Sure. In September 2018 just days before a jury was supposed to be selected for his trial in Washington, D.C., Paul Manafort reached a plea deal with federal prosecutors on the special counsel team. Manafort agreed to plead guilty to two criminal conspiracy charges and to cooperate with the ongoing investigation by the FBI and the special counsel. We now know that Manafort met about 12 times with the authorities, and he testified at least two times before federal grand juries. But we also now know that this cooperation was very rocky, and both sides - both the government and Manafort's defense team - publicly acknowledge now that something very badly went off the rails. Manafort lawyers say he's an old man. He's 69 years old, in ill health and suffering from gout and been in detention since last year. Any misstatements were merely the result of failures of memory and his ill health. Federal prosecutors on special counsel Robert Mueller's team say Manafort intentionally lied to them. CORNISH: What are they saying he lied about? JOHNSON: The authorities say Manafort lied about things large and small - in total, five different categories of things, everything from a payment to a law firm that was doing legal work for Paul Manafort to his contacts with a business associate, Konstantin Kilimnik, who the FBI has linked to Russian intelligence services; to another unspecified ongoing criminal investigation that the Justice Department is conducting. Tonight, Judge Amy Berman Jackson mostly agreed with prosecutors in this case ruling they had met their burden that Manafort intentionally lied about several of those five subject matters, in particular those contacts with Konstantin Kilimnik, with whom Manafort had done some lobbying work in Ukraine and a guy who had been charged alongside Manafort with witness tampering in the course of this investigation. CORNISH: Is there the sense that his lack of cooperation actually impeded the Mueller investigation somehow? JOHNSON: We don't know exactly, Audie. A lot of these proceedings have been happening behind closed doors in secret because these investigations are ongoing. But I think it's clear that authorities would not have taken this step of getting a judge to determine that Manafort had broken up or torpedoed the plea deal unless it was somehow inhibiting their work. We don't know whose cooperation Manafort was supposed to - whose investigations Manafort was supposed to help advance. There are multiple ongoing lines of inquiry from other people who may have done foreign lobbying alongside Paul Manafort to the central question of whether any Americans in the Trump orbit may have conspired with Russians. JOHNSON: Manafort's going to be sentenced on March 13 by this judge, and the judge has pointed out that Manafort may be subject to additional penalties or enhancements because he actually did not fully cooperate. But that's a matter they're going to decide in papers and finally at his sentencing in Washington, D.C. on March 13. CORNISH: That's NPR's Carrie Johnson. Carrie, thank you.